When I bought my 1840s farmhouse I inherited half a dozen 150-foot-plus trees. A couple of the evergreen trees posed a serious threat and eventually I had to remove a Douglas fir and white spruce that were leaning into and casting deep shade over the house for much of the day. I also have a 75-foot silver maple that had a 30-foot branch looming over the house until it was pruned back because during more than one fierce storm, with winds over 60 miles an hour, I leapt off the sofa, heart pounding, to the sound of cracking limbs. I have, thus, concluded that it’s not a good idea to plant “large trees” near houses. I am not saying they don’t have their place; they do, but ideally at a safe distance. Given two factors ― the extreme weather we have been having (two hurricanes in 14 months), and that trees are an important element in anchoring a house to the landscape ― I think choosing smaller tree varieties makes the most sense. In the northeast, white pine, Norway spruce and maples were commonly planted near farmhouses in order to shield buildings from winter winds and shade the roofs in the summer. But when these tall varieties reach maturity they are often out of scale and dangerous to the structures they were meant to protect. It’s rather obvious that homeowners do not consider the mature size of trees when planting and you can see examples of this driving though most neighborhoods. I once saw a solid row of 40- foot arborvitaes covering the entire front of a house, blocking all light and views. When considering planting a tree near a house or outbuilding why not plant small trees that grow between 15 to 30 feet tall? When planting near a building you want to take the mature height (e.g. 30 feet) and add a few extra feet (35 to 40) for safety to find the correct planting distance from a building. I prefer to plant trees near houses that don’t exceed the height of a two-story building because the smaller scale tree helps create intimacy and provides a pleasing view from a window, or framing an entryway, creating a sense of enclosure near a patio or deck. Small trees are also the best choice for planting beneath power lines, where maximum height should not exceed 20 to 25 feet. I divide trees into two categories: hybrid /ornamental and native /wild. I prefer planting the former near homes and buildings, and the latter species farther away from houses because they offer a natural transition to the existing landscape. “Ornamental trees” have showy flowers, or fruit, interesting foliage or buds, attractive bark, multiple trunks, or beautiful branching patterns. Because of these very attractive qualities it makes sense to have them nearby so that you can see the interesting shape, color and texture from season to season; ornamentals usually have several seasons of interest. In early spring, when you don’t feel like venturing outside, it’s nice to be able to take in the view of an early flowering tree from inside. Some suggestions: The first tree to bloom here in the Catskills is Cornus mas – Cornelian cherry dogwood, the longest lived of all Cornus species. Bright yellow flowers open on naked branches in March when nothing else is showing. Last year mine was in flower for over three weeks! Originally from central and southern Europe and western Asia, Cornelian cherry dogwood brightens up the bleakest spring day. Growing to 20 to 25 feet it is multi-stem densely branched and is ideal for screening or used as a hedge plant. 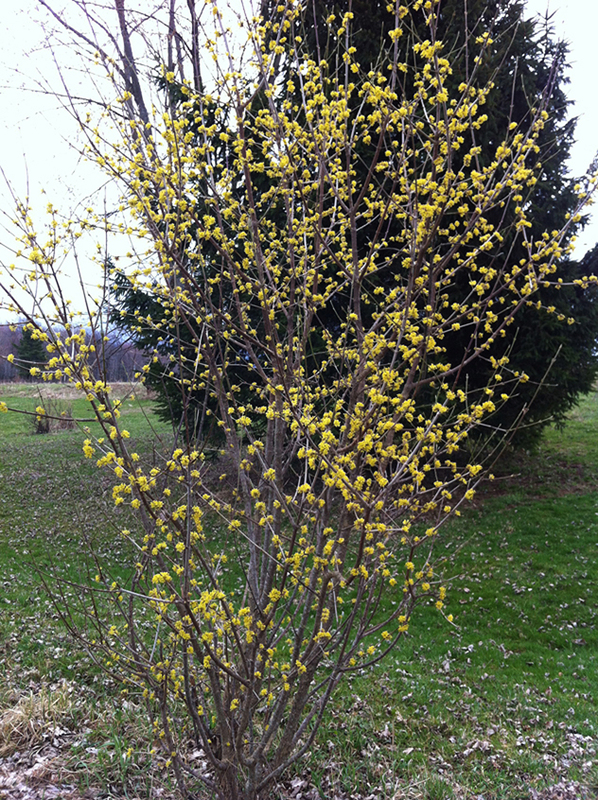 Cornus Mas – first tree to bloom in spring. 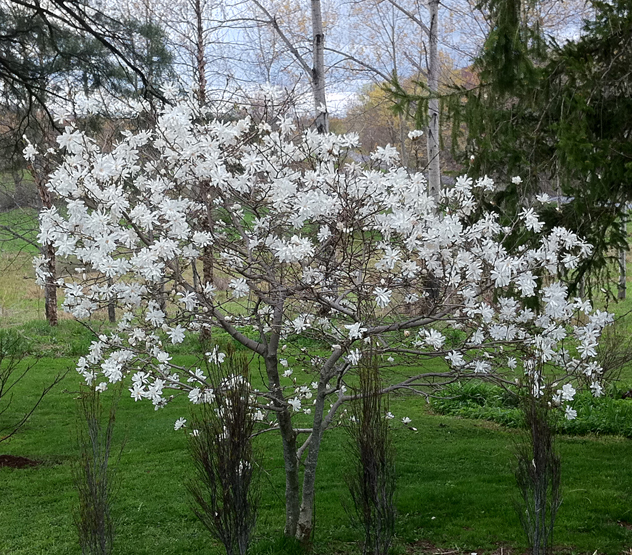 Amelanchier canadensis – shadowblow, serviceberry has many names. A native tree and the next to bloom it grows abundantly alongside country roads, woods, bogs and swamps throughout the eastern seaboard. Its delicate white flowers show up like lace against a backdrop of emerging copper leaves. It has a second vibrant season of interest when the red fruit appears and has good autumn foliage. 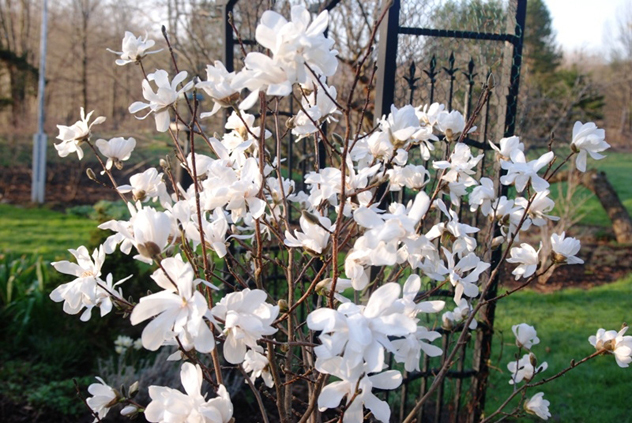 Magnolia stellata – star magnolia can flower up to 20 days because the buds open at different times. It grows 15 to 20 feet high and 10 to 15 feet wide. At first the magnolia looks more shrub like when you buy it, but over time it becomes a dense tree with large dark green waxy leaves, beautiful grey multi-stem trunks, and fragrant white flowers. 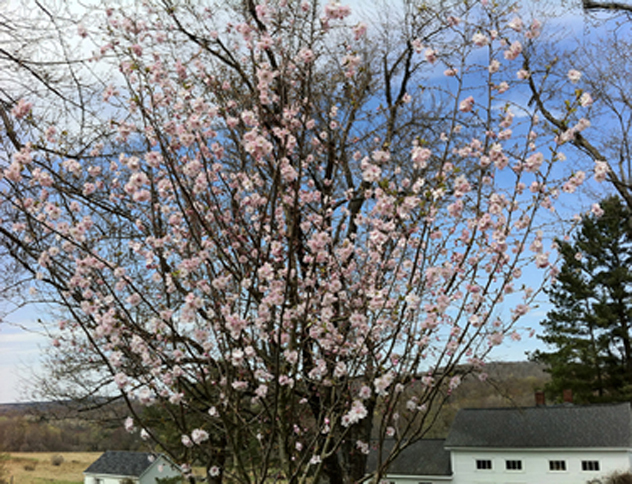 It is one of my favorite small trees and I have planted four throughout the garden. 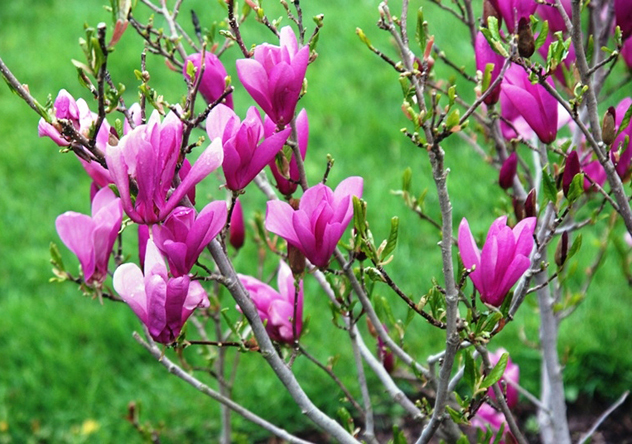 There are several other beautiful magnolia hybrids to consider: M. loebneri, M. ‘Dr. Merrill’ and M. ‘Leonard Messel.’ Last fall, I purchased Magnolia ‘Butterflies’: This cross of M. acuminata and M. denudata usually forms a small tree with an upright central leader or sometimes a multi-stemmed shrub. It has yellow cup- to star-shaped flowers (3 to 4 inches across) that are fragrant and appear before the leaves in early to mid spring. Magnoila Stellata, 2nd tree to bloom for me in the spring. Acer ginnala – amur maple is one of the most cold-hardy maples (zone 3) and reaches a height of 15 to 18 feet and wide which makes it a great choice for a smaller maple. Grown as a large shrub or small tree, it is one of the first woody plants to leaf out in spring. Fragrant creamy white flowers appear with the new foliage and the wings of the fruit turn red in August and September. Acer griseum – paper bark maple has brilliant red fall foliage reaching a height of 20 to 30 feet. I plan to plant one for the winter landscape because its cinnamon-colored peeling bark looks terrific against a blanket of snow. It is very hardy (zone 4) and originates from China. This tree has been on my wish list for years and I hope to purchase one soon. Acer pennsylvanicum – snakebark maple or striped maple. I am always thrilled to find this smaller maple growing in the woods near my house. It’s easily recognizable as it has beautiful vertical white fissures (a snakeskin pattern) that develop on the bark. This native tree grows as an understory tree along the east coast and reaches a height of 15 to 30 feet. It isn’t the showiest of the fall maples but it does turn a nice yellow. I would plant this in the wilder part of the garden. 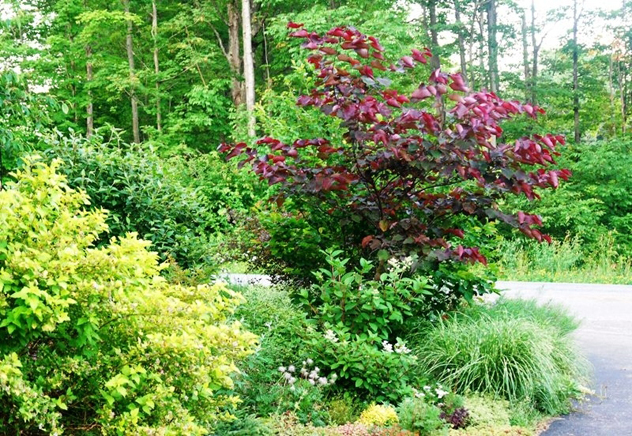 Cercis canadensis ‘Forest Pansy’ – redbud tree is considered the hardiest of the redbuds and has rosy pink flowers in April followed by reddish purple foliage. The purple foliage changes to green in late summer but there is still a tinge of the purple throughout the summer. This native tree is more commonly seen farther south, but I have two gardening friends who have planted them in higher elevations here in the Catskills. This is definitely on my wish list for future trees. Chionanthus virginicus – white fringe tree is found in a variety of habitats throughout the southeastern United States and is cold-hardy to minus 30. No two seedlings are alike in all characteristics. It has been difficult to propagate the native species from cuttings. 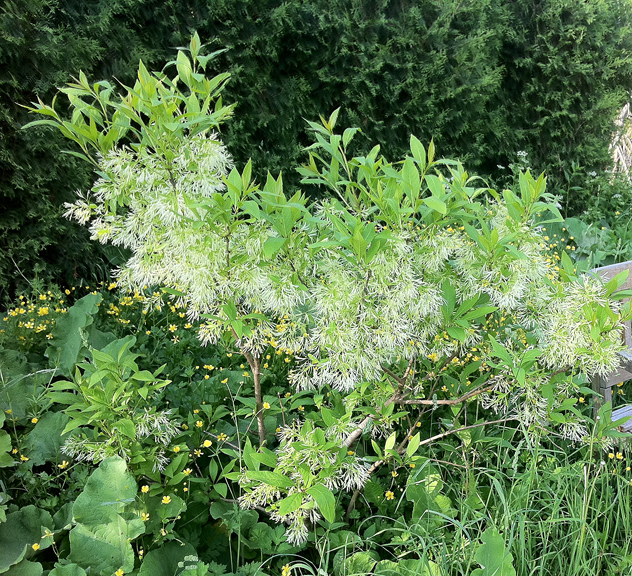 The slightly fragrant 6 to 8 inch long panicle flowers bloom on the previous year’s wood in late May-early June. I planted one in front of a dark green arborvitae hedge so that the spectacular display of white fringelike flowers would stand out. It is one of our best native trees and should be planted more. Cornus kousa – kousa dogwood prefers sun or shade and is considered one of the most elegant of the dogwoods. It has creamy white 2 to 4 inch flowers comprised of four long-pointed bracts that open on distinct horizontal branches in late spring. The tree is much hardier than our native C. florida and is a better choice for our northern climate. It grows to 20 to 30 feet high and wide. I would use this tree as a specimen tree. Give it a good focal point in the garden and don’t crowd it because its strong architectural form needs plenty of space to be appreciated. Crataegus crus-galli var. inermis – cockspur hawthorn (zone 4) is a thorn less hawthorn, a beautiful ornamental tree with 2 to 3 inch flowers appearing in May. The tree reaches a mature height and width of 25 feet. In autumn the foliage turns a brilliant red and is covered in half-inch red fruit that ripens in late September-early October. Several hawthorn hybrids do not have thorns nor are they prone to cedar hawthorn rust. One such thorn less variety, recently popular, is C. virdis ‘Winter King’. I see it planted along many highways now in New York State. ‘Winter King’ is the king when it comes to bright red fruit in the autumn. The very pale grey bark glows behind the red berries. It’s a stunning tree, reaching a height of 20 to 25 feet and is hardy to zone 4. I purchased two of these and they have yet to show fruit but newly planted trees can take a few years to acclimate to their new surroundings. Another good choice is Crataegus phaenopyrum — Washington hawthorn which is the most popular of all hawthorns planted in the U.S. This variety is covered in 1 to 3 inch long spines but the overall habit of the tree is broadly oval with nice lustrous dark green leaves. In my part of New York State the wild hawthorns are one of the first trees to take over a fallow field, but they can’t compare to the seasonal interest of the hybrids. I planted the white-flowering Malus ‘Snowdrift’ crabapple outside my living room window and in spring, from my sofa, I watch as many as 20 brilliant orange Baltimore orioles flit from branch to branch when the tree is in flower, gathering (I guess) the tree’s nectar. Robins move in on this small tree in October and strip it of the half-inch red fruit in preparation for their migration south. Although ‘Snowdrift’ does not possess the showiest crabapples, it is probably one of the best varieties for bringing wildlife into the garden because the birds consume the small crabapples like popcorn. It reaches a height of 15 feet and a width of about 20 when mature. 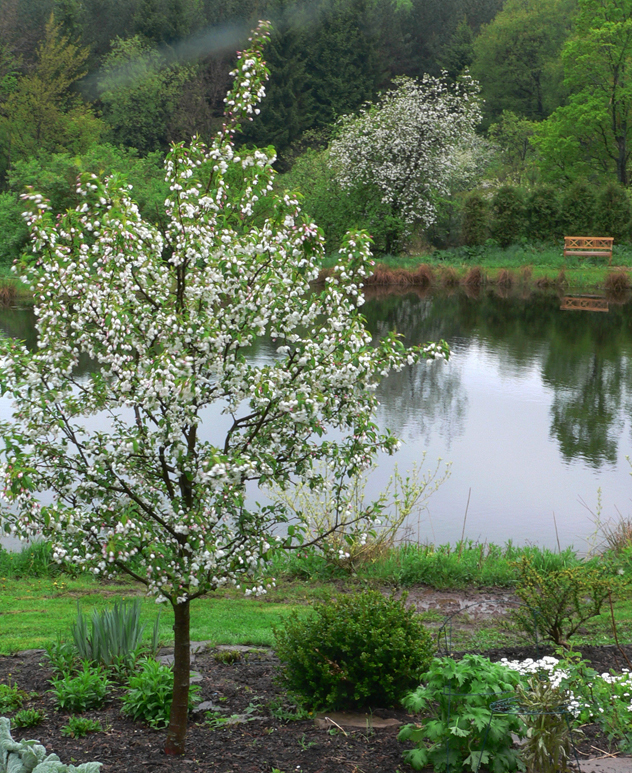 There are so many good choices of crabapples and every garden would benefit from a few. I also planted Malus ‘Donald Wyman.’ It’s worth it to visit a nursery in early fall when you can see the fruit display of the crabapples. Prunus sargentii – sargent cherry. There are only a couple of ornamental cherry trees that are ideal for us in the northeast and sargent cherry is one of the best. I planted this tree a few years back and am amazed at how quickly it has grown. It will reach a height of 20 to 30 feet and is hardy to zone 4. It blooms in early spring when the daffodils are in bloom and makes a nice addition to the early spring garden. It has 1.5 inch bright pink flowers that open before the tree leafs out. After flowering, new reddish tinged leaves emerge which turn shiny green in summer. The fall color is great and it has a small orange and red fruit. The other cold-hardy cherry is P. subhirtella — higan cherry variety ‘Autumnalis.’ I bought three of these trees which I planted around the garden. The tree will bloom in the fall, hence its name, in warmer areas of the country but not for us here in the cold northeast. It is covered in delicate soft pale pink flowers in the early spring and for my money is the most beautiful of all of the cherries.